When Glenda Armand read the autobiographies of Frederick Douglass, the story of his mother walking 12 miles each way to see him stayed with her. Armand, a mom of two, was moved by Douglass’ mother doing whatever it took to be with her son. She knew the story of their bond had to be shared. 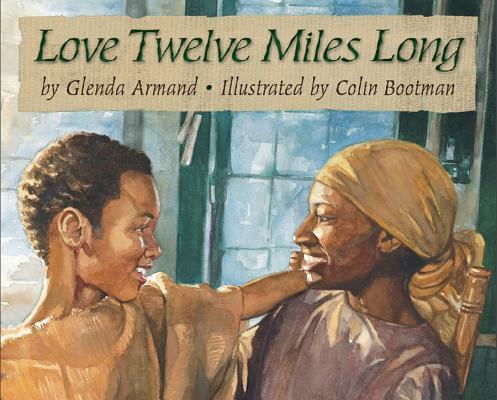 Winner of the Lee & Low New Voices Award, her manuscript, Love Twelve Miles Long, became a poignant picture book illustrated by Colin Bootman. It has been praised for celebrating a special relationship between mother and son and showcasing their love and hope as they deal with the tragedies of slavery and separation. This book had its beginning, first and foremost, with my love of history, teaching and writing. After many years as an elementary school teacher, I made up my mind to teach middle school. (Some of my colleagues would substitute “lost my mind” for “made up my mind.”) In preparing to teach 8th Grade US history, I read Narrative of the Life of Frederick Douglass, an American Slave. In his biographies (he wrote several), Frederick Douglass speaks lovingly of his mother, a slave named Harriet Bailey. Harriet and her son had the same master but lived on different farms, twelve miles apart. Some evenings, after a hard day of labor, Harriet walked those twelve miles to visit her young son and then twelve miles back. Reading about Harriet and her beautiful act of motherly love was a life-changing experience for me. I had to tell her story. I felt Harriet Bailey’s hand guiding me as I wrote it. I told the story by imagining myself as an unseen observer as Harriet and Frederick talked in Old Master’s kitchen. I wrote what I “heard.” The connection that I felt to Harriet was never as strong as when Frederick asked his mother, “Why did God make us slaves?” To me, the question was too difficult and so, after writing it, I literally crossed it out (I was writing longhand). But then I heard Harriet’s voice telling me, “Let him ask the question. I will answer it.” And she did. I am inspired to write about African-American history, particularly slavery, because these were people who, even though enslaved, led lives of consequence. They loved, invented, dreamed and hoped. They dared and planned and triumphed. The institution of slavery, to me, is made all the more cruel if we fail to recognize the humanity of the individuals who were enslaved. We, their descendents, are a testament to a people whose souls, whose spirit and aspirations could not be chained. I feel that I am honoring them by giving them a voice; by telling their stories. 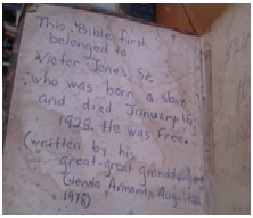 My personal connection to their stories is represented by a Bible which is my most prized possession. 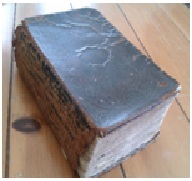 This Bible, printed in 1869, first belonged to my great-great-grandfather, who was born a slave and died a free man in 1928. I met Louise May, the editor-in-chief at Lee and Low, at the annual conference of the Society of Children’s Book Writers and Illustrators. I told her about the manuscript I was writing about Frederick Douglass and his mother. She encouraged me to enter it into a contest that her house had for yet-to-be-published authors. The manuscript for Love Twelve Miles Long won the New Voices Award for that year, which included a publishing contract. I was honored that Lee and Low chose Colin Bootman to illustrate the manuscript. He did a beautiful job. Find out more about Glenda Armand at http://glenda-armand.com/. Check out this fascinating video of four Lee & Low staffers, including publisher Jason Low, walking 12 miles and paying tribute to Frederick Douglass’ mom: http://www.leeandlow.com/p/twelvemilewalk.mhtml.